New Delhi, Jan 24 (IANS) They say men never grow up and filmmaker Madhur Bhandarkar is exploring this pyche of men in a humorous way through his new romantic comedy "Dil Toh Bachcha Hai Ji" releasing Friday. 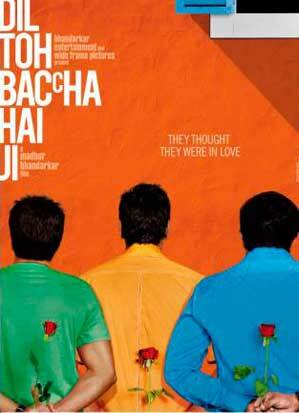 Starring Ajay Devgn, Emraan Hashmi and Omi Vaidya, "Dil Toh Bachcha Hai Ji" is the slice of life movie that talks about three men and their encounters with love. Shazahn Padmasee, Shruti Haasan and debutante Shraddha Das will play their love interests respectively. Naren Ahuja (Ajay) is in his thirties and is going through divorce. While nursing his broken heart following a failed marriage, Naren meets vibrant and bubbly June Pinto (Shazahn) and can't stop himself from falling in love with this young girl. Milind Kelkar (Omi) is a naive poet and idealistic lover. He develops a liking for an ambitious and practical Gunjan Sarkar (Shraddha) who is determined to follow her dreams. But Abhay (Emraan), a charming casanova, is different. His mantra in life is money and women. But his life too takes a turn after an encounter with Nikki (Shruti), a modern girl who knows her needs and speaks her mind. He too experiences love, an emotion he had always stayed away from. According to director Bhandarkar, the film is a funny take on love, with real-life relatable characters, and shows to what extent people would go to achieve it or avoid it. Bhandarkar is known for making hard-hitting and realistic films like "Chandni Bar", "Fashion" and "Jail" which garnered critical acclaim as well as box office success. "Chandni Bar", starring Tabu and Atul Kulkarni, depicted hardships of women working in dance bars, while "Fashion" explored the glamorous but dark world of modelling. The film starred Priyanka Chopra in the lead. His last outing "Jail" put the spotlight on cruel realities faced by prisoners in jail. Although the film didn't do well at the box-office, it was indeed applauded by critics. With "Dil Toh Bachcha Hai Ji", Bhandarkar attempts to move away from serious cinema and take the audience on a laughter ride. However, the filmmaker is adamant that his stamp and signature style will be evident in the film. Just like his director, Emraan, known for playing edgy roles in "Murder", "Gangster - A Love Story" and "Once Upon a Time in Mumbaai", is trying comedy for the first time. Omi has expectations riding high because this is his second release after blockbuster "3 Idiots" and the actor admits this has been a challenging role for him as he plays a Maharashtrian and he had to ensure that his accent is perfect. Last year brought a mixed response for Ajay's films. While "Golmaal 3" and "Once Upon A Time In Mumbaai" and "Raajneeti" were hits, his home production "Toonpur Ka Superhero" and "Aakrosh" failed to impress the audiences. Ajay hopes to start the new year on a good note with "Dil Toh Bachcha Hai Ji", which is the solo release this week.